Gentle Readers, It is with the greatest pleasure that we introduce Kali Pappas, as our guest blogger in conjunction with the Emma (1996) adaptation airing on Masterpiece Classic on Sunday, March 23rd at 9:00 pm. 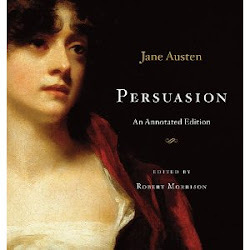 Ms. Pappas has been the pre-eminent authority on Jane Austen’s novel and movie adaptations of Emma on the web for over ten years. 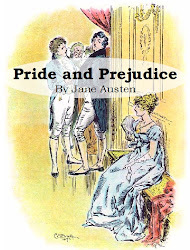 Her beautiful website, Emma Adaptations, is an incredible online resource; including information on the novel, characters, plot, movie adaptation reviews, image & video gallery, and her creative and fun Austen Heroines Quiz. 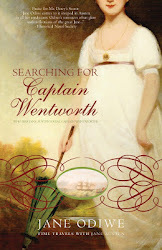 Ms. Pappas’ particular interest is in Regency fashion, and we were delighted when she agreed to write about the costuming of Emma. 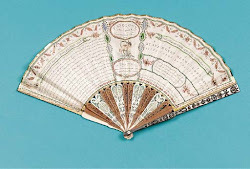 We hope that you enjoy her contribution and visit her lovely Emma Adaptations website. 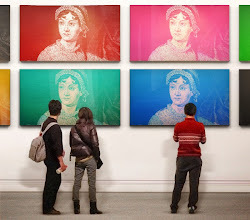 Being handsome, clever, and rich, it's plain that Jane Austen's Emma Woodhouse would have been well-dressed. But what exactly might she - and the various other characters in Emma - have worn? There are passing allusions to muslins, gowns, ribbons, and such throughout the novel, but very little in terms of fashion details. 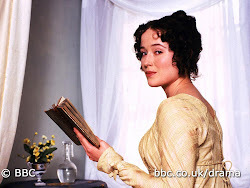 Emmy award-winning costume designer Jenny Beavan, however, has given us a bit of a window into the world of Regency fashion. Through her designs for Emma , we get a glimpse of how Emma, Harriet, Mrs. Elton, and our other friends might have dressed. Sometimes it's pretty. Sometimes it's ridiculous. But it's nearly always entertaining to see who's wearing what as the adaptation unfolds. 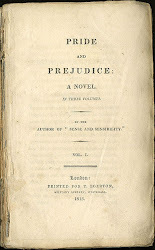 Beavan began by taking historically-accurate designs circa 1815 (the year during which most of the novel was written) and "coding" them to contribute to the narrative of the story. Her designs reflect character personality, mood, and class through costume metaphor - this includes choice of fabric, colors, styles, accessories, and the like. Some of my favorite ensembles belong to the oft-overtrimmed Mrs. Elton, played by the inimitable Lucy Robinson, illustrating her penchant for what I euphemistically like to call "overelegance." 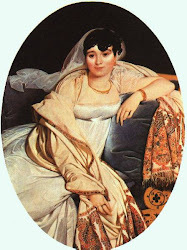 "I do not know whether it is not over-trimmed;" she comments - quite ironically - in the novel regarding one of her gowns. "I have the greatest dislike to the idea of being over-trimmed -- quite a horror of finery. I must put on a few ornaments now because it is expected of me. A bride, you know, must appear like a bride, but my natural taste is all for simplicity; a simple style of dress is so infinitely preferable to finery." 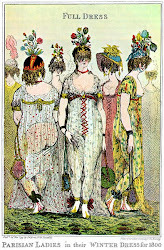 At the Crown Inn Ball, she states in the novel, "Nobody can think less of dress in general than I do -- but upon such an occasion as this, when everybody's eyes are so much upon me, and in compliment to the Westons -- who I have no doubt are giving this ball chiefly to do me honour -- I would not wish to be inferior to others. And I see very few pearls in the room except mine." Of course, we know the real truth. Not that our dear Augusta could have had much REAL concern on this score; given the amount of jewelry the woman has around her neck and on her head in this scene during the adaptation, you'd have to raid the treasure cave in Pirates of the Caribbean at Disneyland to outpearl her. What did Calvin Klein say about bad design and too many trims? Whatever it was, Mrs. E's ballwear likely illustrates his point (and not in the good way. 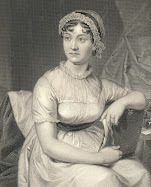 Her strawberry outing gown is another particular favorite of mine, as it suits the always-overdressed Mrs. E to a T.
"I shall wear a large bonnet, and bring one of my little baskets hanging on my arm. Here, -- probably this basket with pink ribbon," she says in the novel, of her strawberry day ensemble. 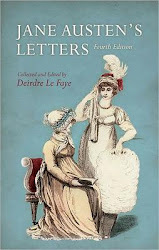 And indeed, Beavan has given her a very hyperbolic bonnet (or rather, hat) - not to mention a rather ornate light blue day gown with ecru appliques and lace - in which to play shepherdess." Speaking of headwear, Mrs. Elton's huge hat isn't the only one worth mentioning. Emma's hats, particularly when juxtaposed with the headwear - or lack thereof - of the other female characters, are particularly interesting. Or frightening. Take your pick. 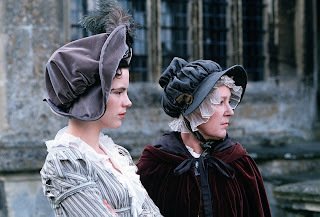 Beavan and Kate Beckinsale, who plays Emma, chose rather tall, large, imposing hats for Emma to accentuate her hawkish, aggressive qualities, while the other, more benign females - sweet Harriet, motherly Mrs. Weston, and service-oriented Mrs. Goddard, for example - wear less intimidating (and more feminine) bonnets. Emma's tall aubergine-colored hat, for example, adds tremendous height and volume to Beckinsale's slight form, much as a kitten's fluffy head and ears create a natural illusion of size to scare off predators. At Box Hill, Emma's illusion of "command" is heightened by a straw-tabbed hat which vaguely resembles something you might see on Admiral Nelson. More, she's wearing a military-influenced, double-breasted spencer; this further symbolizes her status of wannabe "Queen Bee" of Highbury. 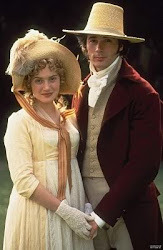 Of course, Box Hill sees Emma out of her geographical and psychological element; she insults Miss Bates and incurs quite the scolding from Mr. Knightley (he has a knack for always telling her what he thinks of her. Almost). Jane Fairfax - who is about the same age as Emma - cuts a different sort of figure. 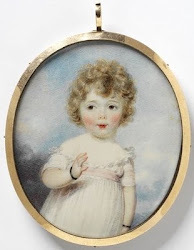 She is elegantly, though simply, dressed in subdued colors which suit her status as an orphan and future professional (well, so Mrs. Elton would like to believe) quite well. 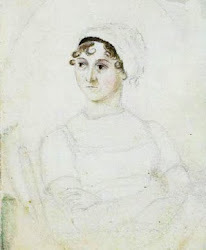 "Emma watched them in, and then joined Harriet at the interesting counter, trying, with all the force of her own mind, to convince her that if she wanted plain muslin it was of no use to look at figured; and that a blue ribbon, be it ever so beautiful, would still never match her yellow pattern. 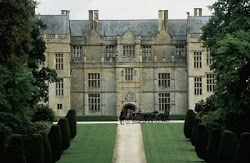 At last it was all settled, even to the destination of the parcel." 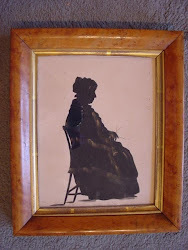 "To be in company, nicely dressed herself and seeing others nicely dressed, to sit and smile and look pretty, and say nothing, was enough for the happiness of the present hour." 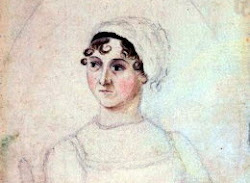 In the adaptation, we witness Emma's and Harriet's first "meeting" in church, where the latter wears a small, unassuming bonnet and nondescript clothing. More, Harriet's hair is down, indicating that she's still a girl. "Adult" women would wear their hair up, as Emma does. 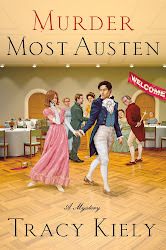 Other class and age distinctions involve some of the male characters in the story, including Mr. Knightley and his tenant, Mr. Martin. 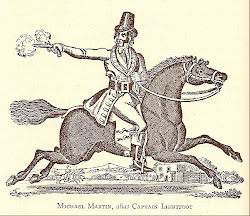 Mr. Knightley wears elegant coats in somber colors and double-breasted waistcoats, the latter of which are echoed in Mr. Martin's more practical ensembles. While the styles of their vests are virtually identical, Mr. Martin's version is better-suited to hands-on labor. He is typically portrayed in shirtsleeves...not to mention a bit dirtied up. Fussy Mr. Woodhouse wears embroidered waistcoats which echo the fashions of decades past, while fashionable young Frank Churchill's fashions border on the dandyish. While we all know that Frank didn't really take off to get his hair cut in the story, Raymond Coulthard's hairdo might make one think otherwise. The older generations: Miss Bates, Mr. Woodhouse, and Mrs. Bates. Miss and Mrs. Bates wear age-correct mob caps. I could go on forever, but these meager examples will have to do for now. 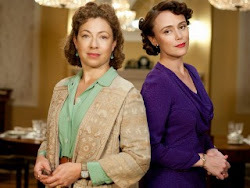 Suffice it to say that there are a ton of apt - and usually quite attractive - costumes in this adaptation. Thanks to the patronesses of this blog for allowing me to share some of them with you! I love the fashions of this era. I have noticed with each adaptation there are subtle differences. 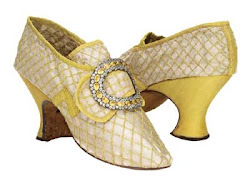 I am trying to recreate them in a smaller version do you know of anywhere that they have patterns like the Janet Arnold ones for this era? What an interesting article! So many subtle messages communicated through hats and styles-it makes me appreciate all the hard work that goes into this part of movie making. Thank you. I really enjoyed this article. Can't stand Emma's hats. Thanks for the explanation. I think there could have been another approach to show her lofty status. Hi everyone! Glad you enjoyed the post. What a fascinating piece, which not only provides a window into the period but also shows how subtle yet powerful is the nonverbal language of dress. You've given me another level of awareness in watching this film. Many thanks for this post, Kali, and to Laurel Ann and Ms. Place for hosting. I'm very happy I now know about Kali's site, too! I've always wondered about Emma's awful hats, which really prevents me from liking this movie as much as the Gwyneth Paltrow version. Your explanation helps. Thanks. Thank you Kali for the info. I am trying to make a costume for a doll that I am making at the moment and I have various pictures including those from the kyoto museum but you really need to see the pieces to get the whole. 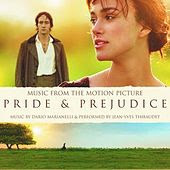 I watched Pride and Prejudice last night as it was on and the costumes were all so different I couldn't make my mind up as to which style I liked the best! plus keeping track as I watched not my strong point!!! thank you again.